Changes could soon take place in the ownership of a controversial oil block in occupied Western Sahara. New player: Wolverine Energy and Infrastructure from Canada. 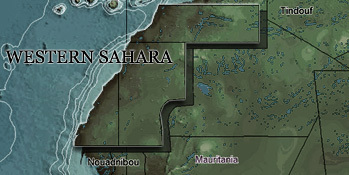 PetroMaroc's Zag block is mostly located in occupied Western Sahara, partly stretching into Morocco. Most licences on this old map have by now been abandoned by the licence holders. PetroMaroc's licence is one of few left. 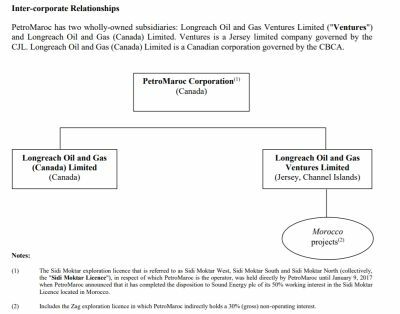 PetroMaroc - and its ownership of the controversial Zag licence - could now be taken over by another Canadian companyPetroMaroc, which owns a minor interest on the Zag oil block in the northern part of occupied Western Sahara could soon been acquired by another Canadian company, Wolverine Energy and Infrastructure. The information about the upcoming take-over has been reported by PetroMaroc in several documents to the Canadian authorities over the last months and on its website e.g. on a press release on 28 November 2018. A final decision on the acquisition is scheduled at a meeting on 17 December 2018. In order to be effective, two thirds of the shareholders must accept the offer. Wolverine, based in Calgary, labels itself as a "full service geo-technical company" providing "diversified geological and engineering consulting services to upstream and midstream companies in the oil and gas, petrochemical and mining industries". No information is available about the matter on Wolverine's own website. "We call on Wolverine not to conclude this acquisition", Erik Hagen of Western Sahara Resource Watch told. "Wolverine has certainly been told by PetroMaroc that the licences are located in Morocco. That is however a lie. The Zag bloc is located primarily in an occupied territory, outside of the international borders of Morocco. Wolverine should know what risk it is undertaking if it chooses to proceed. We appeal to Wolverine's managers to study the maps, the applicable international law and the legal cases undertaken by the representatives of the Saharawi people. If PetroMaroc has told Wolverine what it presents in its company reports, PetroMaroc has not disclosed highly important information", Hagen said. PetroMaroc has systematically referred to the territory as being in "Morocco", which is not correct. In 2011, PetroMaroc (or 'Longreach' as it was called at the time) and operator San Leon, tricked a UK seismic services company, Spectrum, to undertake analysis of data from the block. All documents relating to the sales of shares (as the one to the right) claim that the Zag licence is in "Morocco". The UN recognised representative of Western Sahara has proved willing and able to take private companies and the EU to court for violation of the Saharawi people's right to self-determination. The operator of the Zag block, Irish/UK company San Leon Energy, last month hit the news (see story in Forbes) as the Irish organisation GLAN reported them to OECD's National Contact Point in Ireland for violation of the OECD Guidelines for Multinational Companies. As San Leon had never asked for the consent of the people of Western Sahara in relation to the mentioned oil licence, the company failed to respect their right to self-determination, and thus the human rights articles of the OECD guidelines, GLAN explained to the Irish institution. 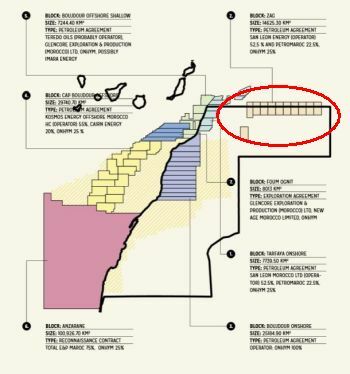 Several rounds of seismic studies have been undertaken on the controversial Zag block. However, the operation has not been progressing as quickly as the Moroccan authorities have wanted. ONHYM, the Moroccan state owned company that issues the licences, proceeded to fine the operator San Leon for not fulfilling the contractual obligations to explore. This conflict has been going on for some time, and ONHYM imposed a penalty on San Leon/PetroMaroc. The dispute is not settled. "The Company has notified ONHYM that a "force majeure" has occurred pursuant to the Petroleum Agreement due to financial, commercial and operational challenges on the licence over a number of years", PetroMaroc stated in a document filed to Jersey Financial and Services Commission on 19 April this year. San Leon Energy, the operator, blamed "the regional security situation" for the lack of progress. PetroMaroc has for a number of years been simultaneously registered in Jersey and in Canada. On 29 August, the company registered in Canada changed name from PetroMaroc Corporation Plc to PetroMaroc Corporation. (See also this name change notification.) The same day, PetroMaroc Corporation was registered as a company in the federal Canadian company registry. One week later, on 5 September 2018 PetroMaroc Corporation Plc which had been registered in Jersey filed a notice of deregistration before the Jersey Financial and Services Commission - or a "certificate of continuance of a Jersey company overseas". The directors of the new company in the Canadian registry are the same as on its website: Dennis Sharp, G. Michael Hobart and Nicholas O. Bridgestock. Ownership changes might also take place in the company San Leon Energy. San Leon has suffered financially, and in 2016 and 2017 two different Chinese groups looked at taking over the small company, so far without it being materialised. PetroMaroc has been present on the controversial block for over a decade. The company was previously called LongReach Oil & Gas, and, before that, GB Oil & Gas Ventures. UPDATE, 09.12.2018: WSRW sent today a letter to Wolverine. Mr. Sharp will serve as non-executive Chair of the board of directors of Wolverine on the completion of the Transaction. Mr. Sharp is a Professional Engineer who earned a degree in Geological Engineering from Queen's University. During the past 50 years, Mr. Sharp has served in a variety of executive capacities in the private and public energy sectors including: Chairman and Chief Executive Officer of UTS Energy Corporation, CS Resources, Command Drilling; as a director of EnCana Corporation, PanCanadian Petroleum, Azure Dynamics; and as a director of many non-profit organizations, including The Calgary Philharmonic Orchestra, McGill Chamber Orchestra and Centaur Theatre Productions. In addition to serving on national and international technical committees, Mr. Sharp has published extensively. Mr. Sharp has served the industry as Chairman of the Canadian Association of Petroleum Producers and in 1997 was honoured as one of Canada's "Master Entrepreneurs". Mr. LePoole is the President of Diversity Technologies Corporation ("Di-Corp"), a role he has held since 2011 and is a current director of the Petroleum Services Association of Canada. Mr. LePoole will serve as an independent director of Wolverine. Prior to his current role with Wolverine, Mr. LePoole held the roles of both Vice President of Marketing and Vice President of Operations of Di-Corp. Mr. LePoole has a Bachelor of Arts (Economics) from the University of Alberta and an MBA from the University of Southern California. Valuators, and is a Chartered Professional Accountant (CPA Alberta).